Carmine spider mites (Tetranychus cinnabarinus) infestations are rare in North Carolina, but can be difficult to manage when they do occur. Carmine mites are often confused with their close relative the twospotted spider mites because of their physical similarities. Both species have a small, ovular body, eight legs when mature, and even the two spots on their abdomen. However, the summer carmine mite female is a bright red, while the twospotted spider mite female is yellow to dark green. Females lay translucent eggs on the underside of leaves. Small, white, six-legged larvae hatch 3-6 days later. The immature mites, called “nymphs” after their first molt, undergo three molts as they grow into adults. In between each molt, the nymphs have a non-feeding “chrysalis” stage. Carmine mites can go from hatching to adult in about a week (4-9 days), depending on temperature. 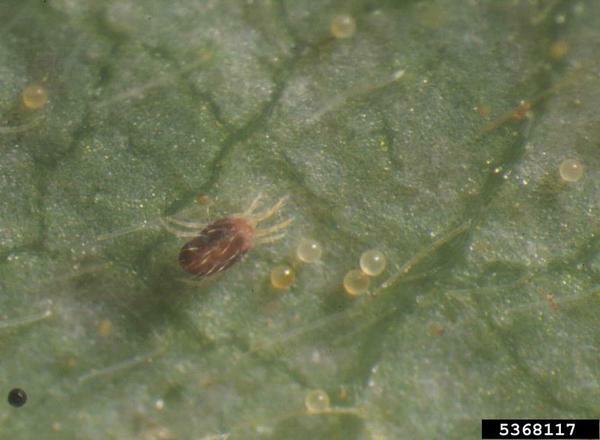 A carmine spider mite and eggs. Like other mites, the carmine spider mite feeds by extracting plant material by using its piercing-sucking mouthparts. Both adults and nymphs prefer the bottom of leaves as the primary feeding source and will sometimes leave thin webbing in these areas. Carmine spider mite damage, along with other mite damage, causes leaves to have a speckled look and heavier infestation of carmine mites will cause leaves to turn pale and withered. Adjacent weeds and other unchecked growth serve as hosts for overwintering spider mites. Good mowing and weed control practices help reduce the number of overwintering sites. Practices to encourage plant vigor, such as proper soil preparation, mulching, fertilization, and irrigation, reduce the likelihood of infestation. Foliar applied materials are available for use against carmine mites. Refer to the North Carolina Agricultural Chemicals Manual for materials recommended for use against carmine mites in North Carolina and the Southern Region Small Fruit Consortium Strawberry IPM Guide for regional recommendations. Several OMRI approved materials, most of which are mineral oil or plant oil based, are available for an organic management system. Good coverage with these products is important to achieve control as such sprays require direct contact between the product and the pest to take effect. As these products have no residuals, frequent applications may be necessary to achieve control. Refer to the North Carolina Agricultural Chemicals Manual for materials recommended for use against carmine spider mites in North Carolina and the Southern Region Small Fruit Consortium Strawberry IPM Guide for regional recommendations. If out of state please check with your local extension agent. Predatory mites available for use against twospotted spider mites can also be used against carmine mites. Although studies on carmine mite control with predatory mites have not been performed in North Carolina, it is likely that, similar to twospotted spider mites, these predators will only be effective against moderate populations of carmine mites. If carmine mite populations are high, a short-residual miticide can be applied a week before predatory mite release to reduce the population of carmine mites.